An ardent supporter of Alexandria Ocasio-Cortez is hosting a family fun run in Astoria next month in support of the freshman congresswoman and the Green New Deal. 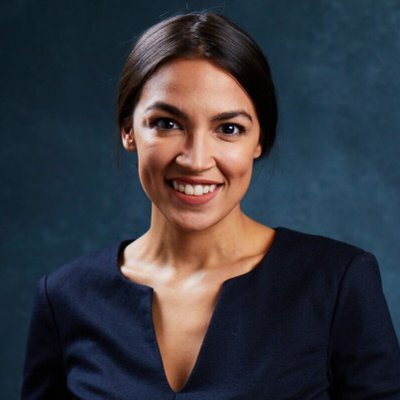 The run, dubbed “The Alexandria Ocasio-Cortez 5K,” is scheduled for Saturday, April 27. 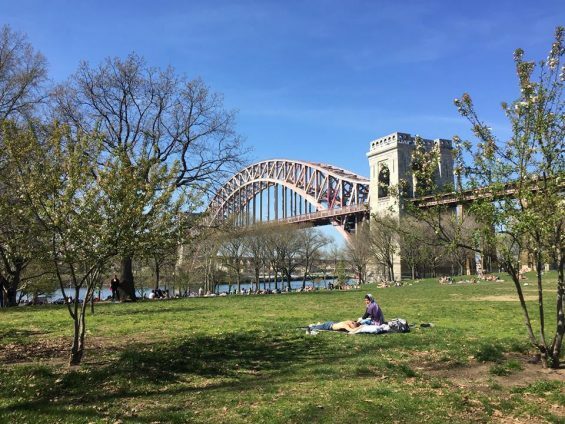 The Earth Day-themed 5K run/walk will start in Astoria Park and take runners along the waterfront on Shore Boulevard. Families can opt to either walk or run the 5K course, and kids can enter a 1K Dash. Tim Hayes, an avid fan of Ocasio-Cortez from Sunnyside, first reached out to the congresswoman’s office with the idea in January. “I think she has a lot of vision, she’s strong spirited, and my whole family believes in a lot of the things she’s promoting and believes she has an opportunity to make some changes for New York’s 14th District, for New York, and for people all over the world,” he said. Hayes, a professional event organizer, said that Ocasio-Cortez’s staff liked the idea and have worked with him in recent months to refine the concept. One request, he said, was that the event be hosted in the congresswoman’s district. The campaign also suggested that the race be held on the Saturday after Earth Day to call attention to legislation that the congresswoman introduced to Congress last month. The Green New Deal—a term that purposely evokes Franklin D. Roosevelt’s New Deal from the 1930s—is a policy proposal with progressive backing that aims to address climate change through the lens of growing inequality. It calls for a massive public investment in renewable energy jobs and infrastructure, and seeks to put lower-income people at the center of a shift towards renewable energy. The cost to register for the 5K is $25 and $15 for the 1K. Rates will increase after April 13. All proceeds, after costs, will go to her campaign. In addition to the registration fee, participants are encouraged to make a donation—in any amount—to the congresswoman. The event is from 9-10 a.m. Free parking will be available on site, although participants are advised to carpool or use public transportation if possible. She is a Big Mistake! Anti-American, Dishonest and Un-Worthy to hold public office. The celebrity billionaire Trump lives in the largest privately owned property on a beach in Florida. Do you think he represents most of the county? This is kind of person certain people elect to make laws that effect our lives/country. When you are evaluating your friends, neighbors and others, say to yourself…”and they get a chance to vote too” . the IQ of the people who voted for/support this wacko is down around their shoelaces. Need to raise the voting age and include an Intelligent test. I’m betting, she’s way smarter than you are. PS: your grammar is atrocious. You most likely would fail (and I quote you) an “Intelligent test” and not be able to vote, so be careful what you wish for. Maybe before you criticize other’s IQ you should learn 2nd-grade English? How? Because the GOP put up an even worse candidate. the woman doesnt even know the three branches of govt!! She reflects poorly on that gender. I mean, Hillary was a big enough idiot to lose to Trump. Now we have this lady. holy cow, this is ridiculous. Tim, why not put that energy into your local community, instead of having the money sent to someone who won’t be able to immediately assist or make improvements for you…..you could have donated it to a worthwhile local cause. no, you give it to the politician. This person is part of a socialist uprising. She has no credibility and no experience. She is riding the I’m a minority and I’m a woman hear me roar wave. Apart from that she has no business ringing you up at starbucks let alone representing your political interests. have placed dozens of North Eastern transplants in new jobs careers and homes. Not one ever said they were fl3ing bad policies. The policies that gave them higher salaries and higher home values then their southern counterparts and arrive here in a position of strength. All did mention escaping the harsh winter’s. Most people leaving NY and NJ are realizing huge gains on homes purchased up here. Tango84- According to Forbes and Craines Business, if you want to make money in the US move to the east and west coast. Even with those higher taxes. The city has gained population it’s upstate Republican districts losing population. Please get informed, it’s not about what you feel it’s about fact,. ” I’m pretty sure”. Even Governor Cuomo has blamed the SALT cap and wealthy New Yorkers relocating for recent drops in tax revenue! The fact is that over 1,000,000 taxpayers have left NYS since Cuomo took office. Much of this outward migration was before Trump was elected and most of it is due to high taxation and regulatory burdens that have nothing to do with Trump. That figure is a net number which takes into account any legal inward migration. Of course, the illegal population has increased but that is also ominous since those folks work mostly in cash economy jobs and don’t contribute to the tax base. Hence the growing push by the Dems to include non-citizens in the Census because if the 2020 census counts citizens only, NYS is sure to lose a House seat and maybe two seats. My guess is AOC’s seat will be the one selected for redistricting but anything can happen. Agreed that there is more outward migration upstate but that does not change the overall trend or the net number of people that have left the state. The SALT cap has little if any impact in most areas of upstate NY. SALT has some impact on the downstate suburbs but a mass exodus hasn’t happened yet. Carl, No doubt much of what you say is true. The danger in this migration for you Southerners is that the wealthy Northern refugees you are receiving will continue to vote for Democrats once they move in down there. Give them a few elections cycles and your beautiful southern states are going to turn into the same blue state garbage that exists up here. It’s also happening on the west coast with California refugees moving to Texas. Marco- Beautiful southern states? Please do some research. According. To the US census southern states are last in education health and salaries. According to FBI stats Southern states are highest in crime. Do some homework. Turn off Fox propaganda. So let me get this straight: “As a recruiter and husband of a real estate agent from Atlanta…” you have placed dozens of Northerners in Atlanta and you’re now saying southern states are ‘last in education, health and salaries? ?’ Make up yer mind jerky. @Marco Polo- ‘Blue state garbage”? You do know blue states out perform red States. Then why aren’t you moving down south, Marco? Why do you continue to suffer under the oppression of all this taxation? Shameless,again it’s all about the money for her doesn’t give a dam about the working class. Hell yeah. We voted her in and now we get to help her pay her staff. I’m there. Really? Does she get a medal for making a cameo appearance? the woman is an idiot-as is the people who voted for her. Shame on those who didn’t show up to vote to prevent this abomination from taking office. Show up to protest this event. This is a disgrace. She and her ilk is what gets Trump re-elected and crowned eventual dictator in chief leading to elimination of all entitlements and benefits and a ruinous civil war resulting in scenes emoted in some of the early classic Black Sabbath songs I’m afraid. We’re already on our way there as soon as Trump is voted out of office, tommers. His cult followers are polishing their guns, stroking them lovingly, to make sure their anointed one is proclaimed President for Life. Hey Tim does AOC have a brain? when do we start drinking urine? I am an environmentalist, but am not in support of AOC’s Green New Deal!!!! Not well planned out at all!!!! What part of the Green New Deal don’t you like, Environmentalist Gabe? So what’s your plan? Give us something to work with instead of simply shooting others down. Why in Astoria? That’s not in her district. Just like other politicians she learns fast. Never go to your constituents, because you will get an eraful. So what you’re saying is that you hate socialism but you think the wealth should be redistributed to the community by the government? You Trumptards sure are special. How do you arrive at these conclusions? Who said anything about redistributing wealth? All I said is she should use the proceeds to do something for the community instead of her campaign. Something is really wrong with people like you. You’re intolerant of anyone who speaks out against your narrow views. By the way, I was a proud Clinton supporter. But thanks for calling me a Trumptard, people like you are going to guarantee he wins another term. There’s nothing wrong with wanting sensible policies that benefit the citizens of this country. > Who said anything about redistributing wealth? You did? Did you forget when you said this, one comment ago? Soooo…do you you think the wealth should be redistributed to the community by the government? If people are voluntarily giving away their money to this woman and it’s given back to benefit the community instead of funding her campaign, that’s considered redistributing wealth? You far left people truly are ignorant and misinformed. The worst part is this comment probably will not get posted because this publication is biased. You can attack me with illogical statements, but I can’t respond. >it’s given back to benefit the community instead of funding her campaign, that’s considered redistributing wealth? Yes. Do you know what redistribute means? So this would be the government redistributing centralized wealth, to the broader community. Agreed JH resident! These types of fundraising run/walk events are usually done to support a charity or a more “noble” cause, not to support a political candidate or public official. To do so clouds the picture and intent for other run/walks held for other charities in general. AOC should direct that the proceeds go to fill an environmental need — preferably in her district— not to fill her re-election bank account. And it sure sounds like an AOC Campaign event, so it should follow campaign finance rules.